Last year I wrote about how I'd become a vendor at the Picton Seedy Saturday event just two years after attending my first one. 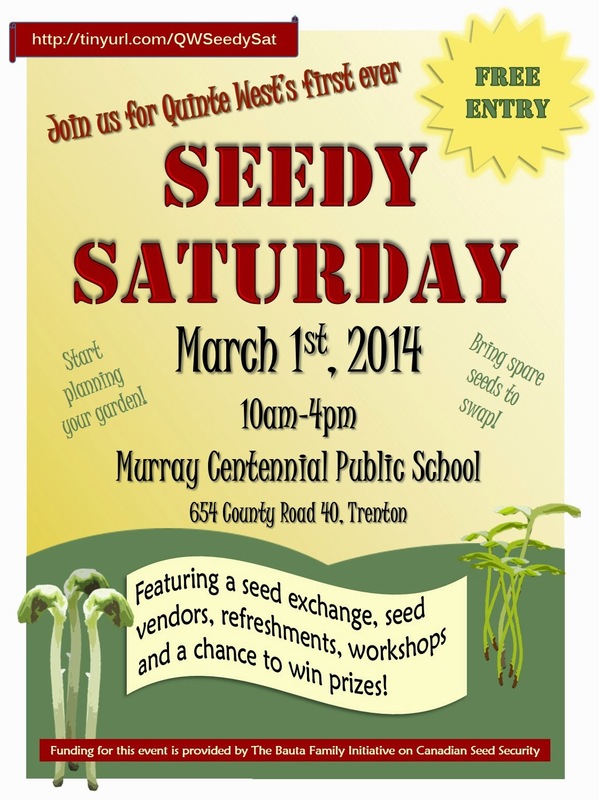 This year I became one of the organisers of a new Seedy Saturday in Trenton. I feel as though I've been on some sort of apprentice-training scheme with these events, with my involvement gradually escalating. This event was a scion of the Picton one, with one of the Picton organisers encouraging our efforts and coming to the first meeting of the Seedy Saturday Quinte West committee. We applied for start-up funds for the event from the Bauta Family Initiative on Canadian Seed Security - and were fortunate enough to receive $350. Thirteen vendors from a range of farm and seed-related businesses paid a small sum for tables on the day and we received enough contributions in kind to fill four raffle baskets, which proved a good fund-raiser. Around 80 people came through the doors on the day, which we were really pleased about. Donations for the book table and seed swap table brought in additional money, ensuring that we have enough in our bank account to pay for the hire of a venue in 2015. This means that the event should be self-sustaining after this first year. If you get a chance to go along to a Seedy Saturday or to get involved in one, I can highly recommend it. There's always an interesting range of people to talk to and seeds to pick up. I was relatively restrained this year and only came away with four new packets of seed: one bean, two tomatoes and one pepper. I wish these events were publicized more as I never hear about them till after the event. I'd love to attend these. We didn't have a budget for advertising this year, Linda - but next year I think we will (I'll try to remember to drop you a line, too!!). Oh, and I ought to mention that Seeds of Diversity maintain a list of upcoming Seedy events on their site at http://www.seeds.ca/ev/events.php. What a wonderful event! I would love to attend one of these (as a customer!). I've only just started saving seeds myself but I'll have to see if there is one in my area (Kemptville) - I might even volunteer! Good on you for helping to make this one happen.